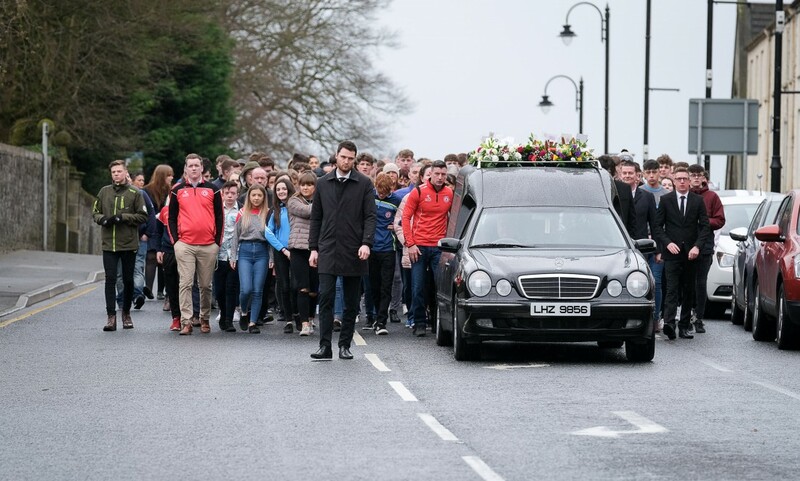 A SENSE of immense grief hangs over Tyrone this afternoon following the funerals of two of the three teenagers who tragically died outside the Greenvale Hotel in Cookstown on St Patrick’s night. Morgan Barnard (17) has been laid to rest at the Carland Road cemetery outside Dungannon after his Requiem Mass in St Patrick’s Church. An hour later, Lauren Bullock (17) was brought to her final resting place in the cemetery adjoining St Patrick’s Church in Donaghmore. The funeral of Connor Currie (16) will take place this afternoon in St Malachy’s Church, Edendork. Students from local post-primary schools formed a guard of honour as the cortege moved silently to the church for Morgan’s funeral at 10am. In his homily, the chief celebrant, Fr Aidan McCann, said Morgan was someone with a ‘strong personality’ who didn’t care too much about the opinions of others. He added that this individuality was reflected in his hair styles and colours, flambouyant shirts. “Morgan was a humble young man, who would always listen and be there for someone if they needed him. He had a real passion for the Irish language and was very well known and loved in the Gaeltacht,” Fr McCann said. Reflecting this, many of those in attendance were from Gaeltacht areas and at the conclusion of the Mass a moving reflection was recited in Morgan’s native tongue. Shops and businesses in the village of Donaghmore closed for the duration of the funeral of Lauren Bullock. Over 1000 mourners lined the main street as her cortege moved from her home to the local St Patrick’s Church. Pupils from the two local primary schools, St Patrick’s and Donaghmore Primary and students from the local post-primary schools were among those who formed a guard of honour, while her remains were flanked throughout in a poignant tribute from fellow members of her cheerleading squad. Fr David Moore, who was the chief celebrant said that St Patrick’s Day in Donaghmore would always in future be recalled with sadness as people remembered Lauren. He spoke of how a ‘dark and threatening cloud’ hung over the community as they struggled to come to terms with the tragic turn of events on what ought to have been a night of fun, dance, friendship and laughter.